The Lost and Found Case Of Mr. Pinocchio – Grab a cuppa, tell a story or listen to one. 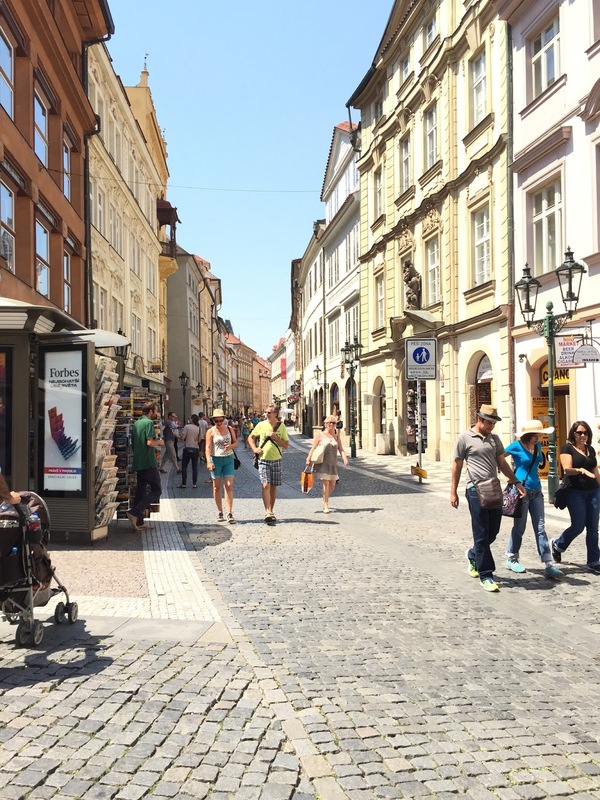 On a beautiful cobbled street, in Old Town Prague, sat Mr. Pinocchio smiling at the passerby tourists and shoppers. The sun was extremely harsh and strong and scorching our backs.There was a little shade by the window where Mr. Pinocchio sat. So we took a break from walking and sat there by his window. He looked at us and we looked at him. Such warmth and life in him and he seemed exceptionally happy. After a while, we headed to where we were meant to go. But there was something very special about Prague(we fell in love with the city) and Mr.Pinocchio. For as many times we crossed that street by the Old Town Clock, he smiled gleefully at us. He stayed in our mind all throughout the stay in Prague. The day we were leaving Prague, we decided we cannot leave without him. We could not bring Prague home with us but we could absolutely bring Mr.Pinocchio home with us. And he arrived with us at our next stop, Vienna, the music capital of the world. At Vienna, we felt living in a bag could be really uncomfortable for anyone, specially when the mercury was soaring to about 35 C. So we got Mr.Pinocchio out of the bag and gave him a nice cool spot in the roomy closet of our hotel room. The husband moved him around in the closet to give him an even more comfortable spot. In a few days, we moved again to Salzburg. Remember Love Locks ? It was only while unpacking in Salzburg, we realized we had left Mr.Pinocchio in Wien. A sudden sadness enveloped suddenly. Amidst the “who packed”, “who checked the closet”, “how could we” and clothes turned upside down on the bed of a hotel room, the husband and I called the Hotel in Vienna. The connection wasn’t the greatest and the receptionist on the other end had little patience. “A puppet. A marionette. It must be in the closet. It’s in a white bubble pack. 2 feet long.It’s a Pinocchio. Room-216. Please check for us,” we must have repeated this twenty times over on a poor phone connection. 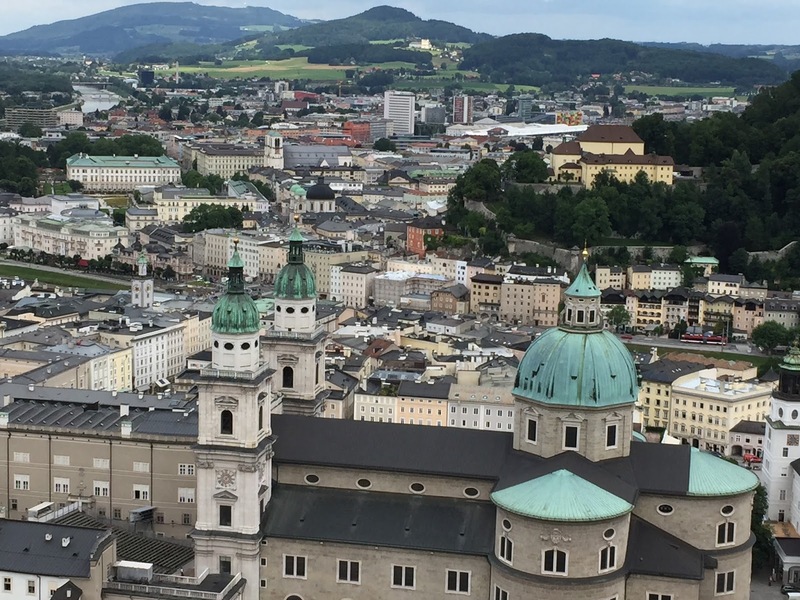 A Bird’s eye view of the city of Salzburg. We were immensely disheartened. But what more could we do. We spent the day in the charming city of Salzburg, heard great music on the street (it is Mozart’s birthplace after all), had the best Italian food of our life and retired for the day. But not before sending one last email to the hotel. I think the good food did the trick. Mr.Pinocchio was hovering our minds as well. The husband coaxed me into writing and I wrote a nice email overusing “Please” to the hotel without putting up my hopes too much. The next morning, a surprise reply came back from the hotel. We found the marionette in your room. Please let us know where we could ship this to you. We told you how we found Mr. Pinocchio. But how did we lose him in the first place ? I am always the last one to inspect the room for any personal belongings before we check out of a hotel room. It is my job. I like to do that and invariably find something important. That one final check before the keys are turned in. But I missed Mr.Pinocchio. The answer came in through a seemingly important question the husband asked me the night Mr.Pinocchio arrived home. “Didn’t you check the top rack of the closet when you last checked the room in Wien?” , he asked. From where we stand, my husband and I both see things differently. Very differently unless there is a step stool available for my perusal. He most often forgets the simple fact that visibility is directly proportionate to one’s stature and ours is almost a feet apart.